Many of you know that I head over to the other side of the mountain now and again. (I am there now!) 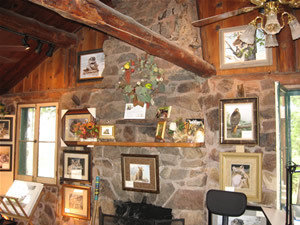 Recently I came across a new wildlife artist snuggled in at Sky Forest. 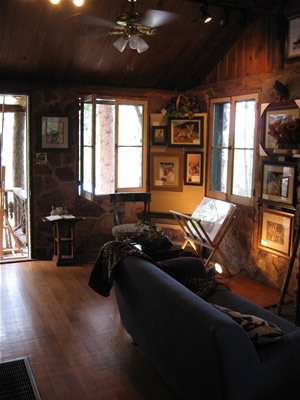 I love that little community and actually had gone over to visit Cabin Fever, the little book shop nestled in the collection of cabins. 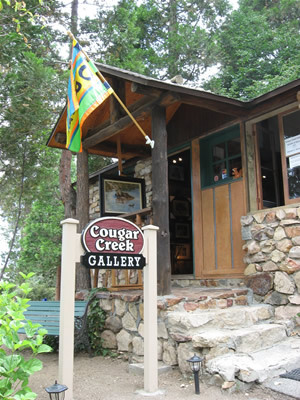 Anyway, the gallery is called Cougar Creek and hosts the work of Brenda D Johnson. She had just opened within two weeks of my visit so it was exciting to stumble upon the little place. 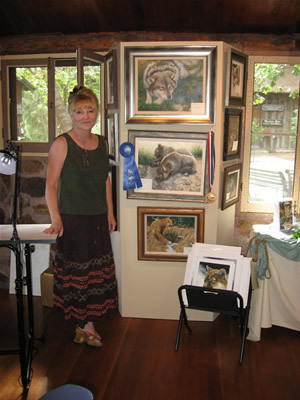 Brenda is an Associate Member of the Society of Animal Artists in New York, the Wildlife Artists Association in California, and a Signature Member of the (WNAG) Worldwide Nature Artists Group. 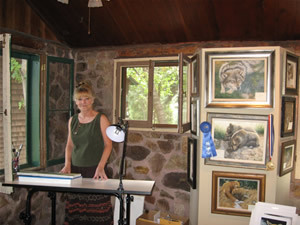 You might have seen her in Inland Empire Magazine or at one of the galleries in Lake Arrowhead. She also is exhibited in Utah. Anyway, I had a good time visiting with her and lots of people were dropping by to say hello while I was there. Brenda and the photographer next door have shows on the weekends. If you don’t want to commute ALL the way over there, you are in luck as she will be showing here in Big Bear at the Art on the Lake event on August 18-19, 2007. Drop by and tell her you learned about her at the Fawnskin Flyer! This entry was posted on Monday, August 13th, 2007 and is filed under Uncategorized. We also discovered the gallery on a recent visit to Sky Forest. If you’re looking for a nice afternoon drive the deli, photo and art gallery, and bookstore make for a very enjoyable destination.